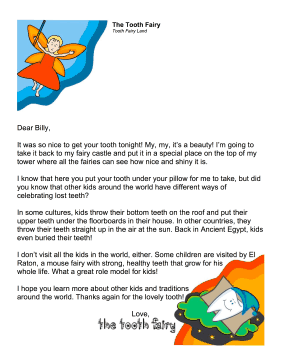 Children can learn about other traditions in cultures around the world with this printable tooth fairy letter. It was so nice to get your tooth tonight! My, my, it's a beauty! I'm going to take it back to my fairy castle and put it in a special place on the top of my tower where all the fairies can see how nice and shiny it is. I know that here you put your tooth under your pillow for me to take, but did you know that other kids around the world have different ways of celebrating lost teeth? In some cultures, kids throw their bottom teeth on the roof and put their upper teeth under the floorboards in their house. In other countries, they throw their teeth straight up in the air at the sun. Back in Ancient Egypt, kids even buried their teeth! I don't visit all the kids in the world, either. Some children are visited by El Raton, a mouse fairy with strong, healthy teeth that grow for his whole life. What a great role model for kids! I hope you learn more about other kids and traditions around the world. Thanks again for the lovely tooth!